Crossfire II 2-7x32 Rimfire is rated 4.7 out of 5 by 25. 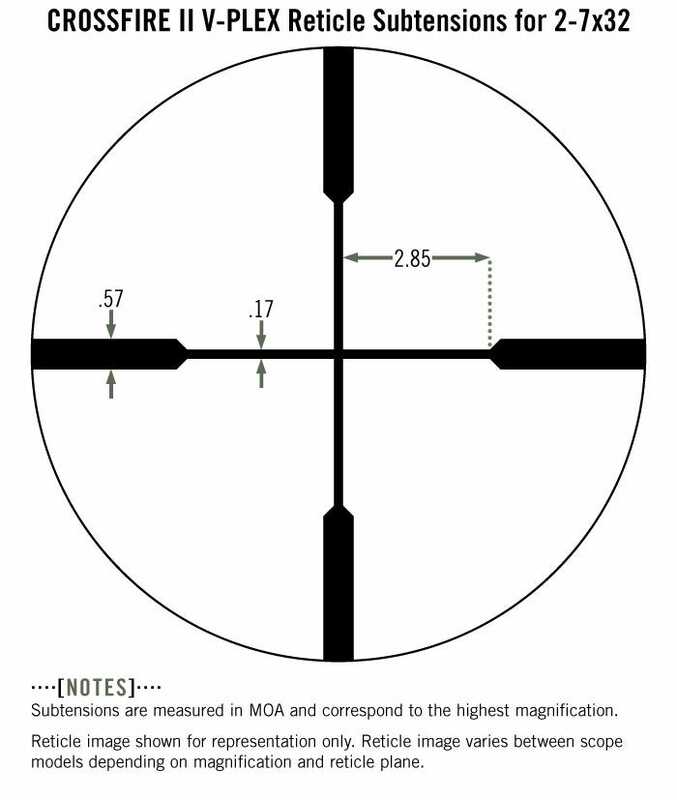 Subtension detail for Crossfire II 2-7x32 Rimfire riflescope with V-Plex MOA reticle. Rated 4 out of 5 by Chaos Kuma from Awesome Rimfire Scope I love this Scope. My first impression was; How sturdy this scope was! It felt like a much higher power scope with a bigger price tag. It is solid! Then the glass is clear and brings a good amount of light even on a overcast days. (Typical Seattle/Bellevue Weather) It goes nicely on RA .22 upper on my self built RA lower. Thanks Vortex for bringing high quality glass to the affordable market! Ok... My only tidbit... At 7x the rectical cross lines aren't as fine as I would hoped. Not super big for target/plinking practice but when hunting small game, it may cover that extremely small vital area. This is the Only reason I 4 stared this scope. Rated 5 out of 5 by Spotpony from 'INCREDIBLE SCOPE AT ANY PRICE! I bought this scope for a S&W M&P 22... Unfortunately, the gun didn't exhibit the kind of accuracy that I was hoping for. The scope absolutely worked like a charm though. I decided to put a Sparc AR red dot on the gun instead and was much happier with the results. I had on old Winchester .22 that needed a scope so I mounted the Crossfire II on it. I am thrilled with the results! It took three shots to zero the rifle. After sighting in, the gun shot 1/2" groups @ 50 yards consistently. I couldn't me more pleased with the quality of glass and accuracy of adjustment in this scope. I'd give it 10 stars if I could. Rated 4 out of 5 by Brett in Rifle from Great value! I bought one for a used .22 long rifle I bought and loved it. So when I bought a .22 WMR later that year (2016) , I just bought the same scope for the magnum. Rated 5 out of 5 by colee from Perfect for your .22 Have this on my 10-.22, love it. Put 2,000 rounds through it and it shoots as if it was right out of the box. Rated 5 out of 5 by Matt from Great Scope! I have this on a Savage bolt 22 mag. I love this scope! Super accurate and clear. Lightweight but still feels durable! This scope has turned my 22mag into any little critter's worst nightmare!!! Rated 5 out of 5 by Oldfrog72 from "Bang for the buck" I'm an avid hunter & shooter & very picky and demanding of my optics. I have 8 Leupold, 2 Zeiss and 2 Vortex scopes. Bought my first Vortex two years ago to put on a Ruger 10/22. The quality of the glass, coatings, tracking and repeatability of the Vortex scope is outstanding! Don't forget the Vortex warranty! All of my scopes are tried & true. Vortex has been added to the list! As far as value for the dollar, it is tough to beat the quality of Vortex! Rated 5 out of 5 by Bryan J from Versatile Bought this for my kids .22 on an AR platform. There is enough room on the tube for a wide range of adjustment for kids eye relief needs. Once sighted in we have shot over a 1,000 rounds with no issues, zero remains true. The variable power is nice when shooting 50 plus yards but for the most part it is left at 4x. 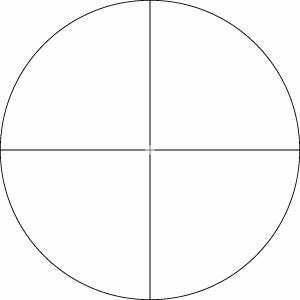 A BDC reticle option would be an improvement as at 7x, making 100 yard shots are very doable. I have yet to be disappointed with a Vortex product.